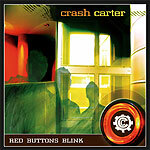 CD review: "Red Buttons Blink"
This review first appeared in Turbula in July 2005. With bright lead vocals, sunny electric piano and smoothly percolating rhythms, San Diego County's Crash Carter has the kind of immediately friendly pop-rock sound that once populated AM radio. Think the Zombies, Ace, Squeeze or Crowded House, but updated for contemporary ears. Vocalist/keyboardist Casey Gee has a strong, soaring voice, not so different from that of Paul Carrack (Ace, Squeeze) or Neil Finn (Splint Enz, Crowded House). In fact, Crash Carter's overall bubbling sound of pop purity draws much from Carrack's and Finn's respective bands. Drummer John Mears and bassist Jeff Bowman provide a constantly shifting, consistently intriguing backdrop for Gee's voice and keys. Best of all, the band manages to turn out the same kind of interesting, well-crafted pop songs the above comparisons practically demand. If d.j.s still picked their own playlists, cuts like "Jungle," "Tidal Waves" and "Unreal" would be getting picked up by Casey Kasem Saturday morning. Those days are gone  or least in remission  and so whether Crash Carter is able to find the national audience they deserve remains to be seen. In the meantime, those of us in San Diego have something very special to savor.